If you are looking for a high quality inversion table for a pocket friendly price then the Health Mark Pro Inversion Table Reviewed here may be a great choice. When my back started to feel some twinges I started to research the different options for inversion tables, and have posted some of the best tables here. The great thing about the Health Mark Pro was that it offered a great combination of safety, movement and stability while remaining comfortable. The price was also good at less than $300. Ankles supported in comfortable nylon bracelets. What makes the Health Mark Pro different? This is probably the first inversion table that we would view as being built well enough to be considered professional grade. While lower end tables are all safe and do the job, they can feel a little wobbly. 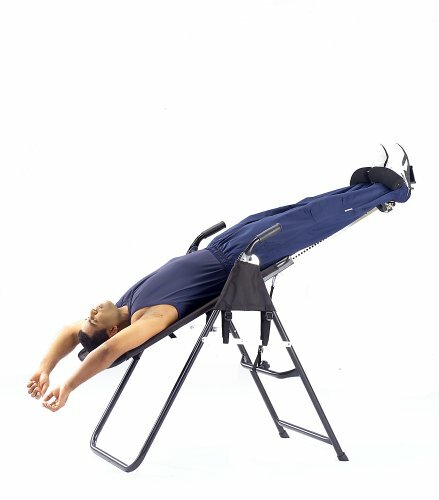 If you are not 100% confident in the safety and stability of your inversion table it can be incredibly hard to relax and let gravity work its magic on your back pains. The Health Mark Pro is part of the Health Mark brand which produces some high end products such as the $800 Pro Max version. For my money I would always buy and entry level model of a high end brand, than a top end model of a low quality brand. This way you benefit from the investment in quality and engineering that makes high end brands high end! The health mark pro is no different. The build and ‘feel’ of this inversion table are excellent for the price. Little features such as the extra thick steel tubes and extra thick nylon backboard adds to the rigidity of the table without increasing the weight, so its still transportable. This is an incredibly simple table to use, and if you are familiar with this type of table can be operated with just one person. For safety reasons we would always suggest having someone else in ear-shot just in case of an unlikely problem. The Health Mark features a clever safety pin that allows the table to rotate to a maximum of 4 inverted positions. Each position will help with easing pressure on different parts of the body. You can choose from a gentle incline to near total inversion, as you can see from the image the ranges go from 20 degrees up to 80 degrees from horizontal. Setting up the machine is incredibly simple, it does require some self assembly. In our research we have never had any issues with parts being missing or any real difficulties in the assembly. In fact most people seemed to have this assembled within about an hour. One down side of this machine is minor, however the quality of the tools is not great. If you have a basic wrench and socket set then you will have a much easier time completing the assembly. We really like the stable base of this inversion table, all the more incredible due to its weight of just 50lbs. As mentioned earlier the stability gives you a huge increase in confidence when inverted. This allows you to relax properly when in position this in turn can release more of the tension in the back giving a better overall treatment. The stability comes from both the thick steel tubes that a far better than less expensive models. The separation of the legs is also far better giving a big stable base for the inversion table to sit on. Overall this is really the first model that I have come across that I would want for long term use, others while still safe do feel that little more flimsy. The Health mark Pro features a standard system where the ankles are held firmly in a solid plastic contoured bracket. A solid foam roller is then secured over the feet to ensure a solid, and after a while comfortable lock. We did have to fiddle about with our shoes to optimise the fit, tight enough to secure our feet, loose enough to allow the toes to still move. If you can’t move your toes then there could be to much pressure and cause feinting. Will it help your back pain? There is never really a silver bullet for back pain, as everyone needs are different and you should consult a physician before starting any inversion table treatment. However many users have tried this table, and found that has been positive for managing the pain of trapped nerves and general pain in the back. 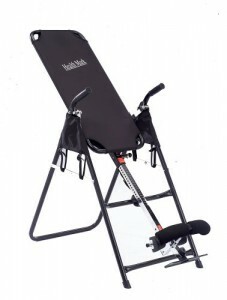 What are others saying about the Health Mark Pro inversion table? What are other users saying about the Health Mark Pro Inversion Table? Like us everyone appreciates just how robust this table feels, for not a huge device its rock solid. Overall it scores 4.8 out of 5 stars on Amazon. If you have a budget of about $300 for a new inversion table and want to experience a great quality treatment then we highly recommend the Health Mark Pro. This is probably the first machine we would consider to be in the professional level. You can of course spend more than this to get additional features. What you won’t get is much more in the way of stability and ease of use. This table will give much needed relief to all kinds of back pain from the comfort of your own home. The first real inversion table that we can feel comfortable and secure aboard.